It’s a very well known fact that the Great Firewall of China is giving a hard time to the average Chinese users or foreign visitors to China. Not only is the bandwidth congested due to huge number of connected devices and domestic broadband overselling, but there are also a lot of practices in place that censor or restrict the access to some services such as Facebook, Gmail, YouTube, Twitter, western news outlets and the list goes on. For more information about the restrictions and censorship situation in China, we recommend reading our detailed article which will help clear up any questions you may have. Means for traffic obfuscation – basically a method to disguise traffic in order to avoid being blocked by the Great Firewall of China, which is using signatures and algorithms to identify and block well-known VPN connection types. Good peering with Chinese ISPs – meaning increased bandwidth which will ultimately increase the quality of the service. A good number of server locations in the neighboring countries such as Hong Kong, Japan, South Korea, Singapore etc. (in many cases, smaller geographical distance means also lower latency but it’s not a general rule for China). VPN service websites and technical support must be reachable from China. It’s no use having technical support if you can’t reach it due to the restrictions that are in place or if you can’t sign-up for the service, read tutorials and so on. Support for China based payment methods such as AliPay and UnionPay which are very popular in China. These are some of the most important features to look for in a VPN service when you are in China. There are other features as well, and we will discuss particularities for each service as we cover them. In this review, we will be talking about those few VPN companies that offer a strong quality service and are a viable option for both for Chinese users, as well as travelers and expats in China. Highly praised an very well known for its services within the Chinese and expats community, ExpressVPN offers a fully-featured, widely compatible and all-together sturdy VPN service. It has been around for a while and somehow it managed to get past the restrictions that China has in place for internet content. Surprisingly, as big as this service is, their website isn’t blocked in China. We are just going to present a few of the key features relevant to the Chinese VPN market, however if you are interested in reading the full review containing the detailed information, you can find it here. The review also includes an in-depth explanation of how Deep Packet Inspection is used in order to block certain content and other valuable information that will help you better understand the situation. Servers available in over 130 locations with up to three simultaneous connections available. They support multiple protocols such as OpenVPN, L2TP/IPsec, SSTP and PPTP. Apps available for all modern operating systems (Windows, Mac, Linux, iOS, Android). Good number of payment methods available with a 30 day money-back guarantee. Very stable and well-performing service all around. We would also like to talk about the speed tests rand through Express VPN. They may be different than what you would expect from a VPN service, however we have to consider the bandwidth congestion that is a detrimental factor. 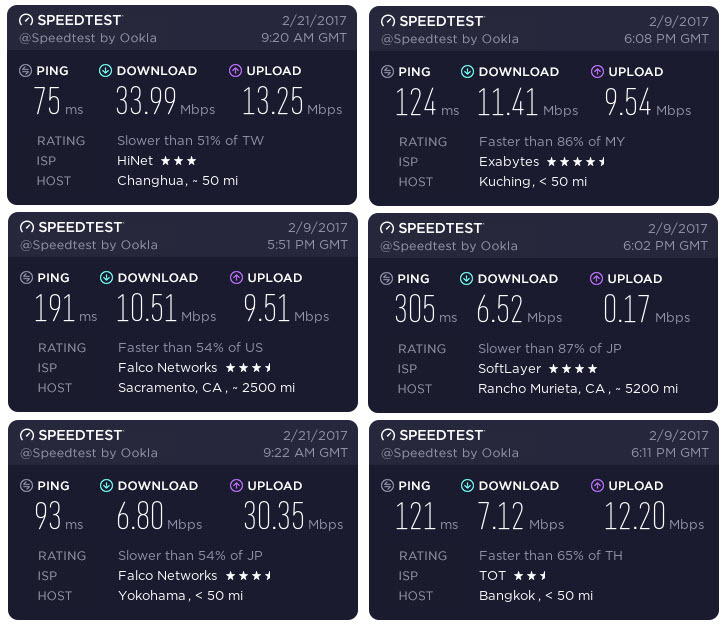 It doesn’t seem like a lot, but taking into consideration the poor quality of the internet connection offered by most regular ISPs we have to say the test results were quite decent. The connection was very sturdy and never got disconnected. A good number of locations available, quite a few in China neighbor countries. VPN client app is extremely simple to setup and use. We really like it. VPN app has latency and download test feature, very useful to get an idea what are the best locations to connect. 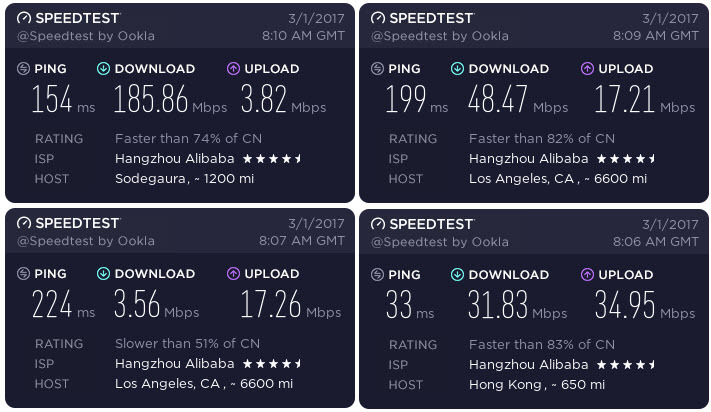 Decent speed test results considering it’s been tested in China. Bandwidth congestions are common, either due to the high number of customers or not so good peering. A bit pricey, though the 30 days refund policy doesn’t have hidden/small print conditions. The Romanian based VPN service is operated by Netsec Interactive Solutions, a security company managed by a dedicated staff with more than 15 years of experience in the internet security field. The company has been growing gradually and improving their service all the time with feature updates and innovations. If you would like to read a more in-depth review about VPN.ac, you can find it here. The review explains how the lack of congestion and strong infrastructure make it a valuable player on censored markets such as the Chinese one. There are a lot of innovative features that VPN.ac brought to the table so here are some of them. VPN.ac offers several ways to obfuscate the traffic with OpenVPN and their browser addon (SecureProxy) which provides a fully encrypted TLS tunnel for browsers, quite effective in by-passing the Great Firewall of China filters and blocking techniques. 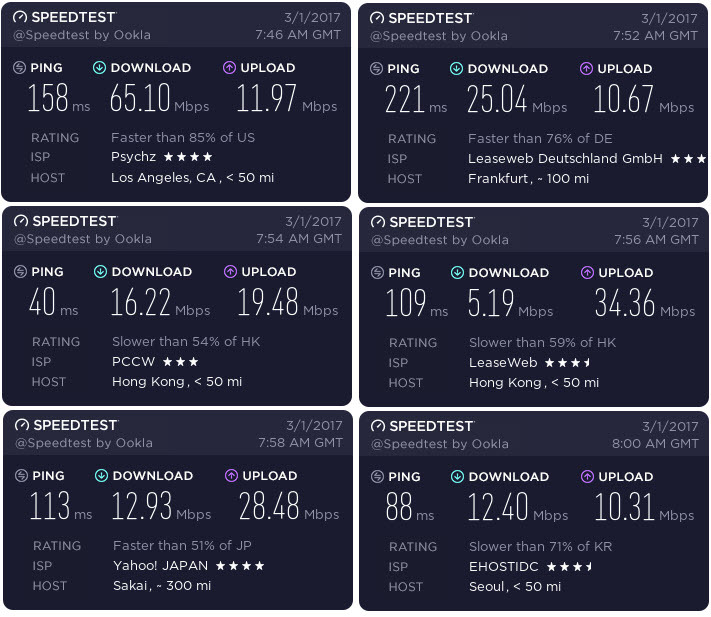 As you can see in the speed tests results attached, in some of them it is very similar to what one would experience in a non-censoring country, where network congestions are not something to deal with on a daily basis. However, it’s safe to be aware that when it comes to Internet connections in China, as described into detail in the article we linked in the beginning of this article, there is no general rule and the quality of local connections depend from one user to another. While one can have a good connection overseas, others may feel they are back in the dial-up ages. Very fast connections in China, they have lots of servers with optimized peering for China ISPs. Many OpenVPN connection types available along with obfuscation methods which are ideal when dealing with the Great Firewall of China. The first in the industry to encrypt DNS queries, one of the very few to support Elliptic Curve Cryptography. SecureProxy extension for Chrome and Firefox is included into the price and is working very well in China. Not expensive at all, 7 days refund policy without hidden conditions. Software could be a bit confusing for the complete non-technical users but it does the job. In conclusion, whether you choose to opt for a bit VPN service such as ExpressVPN or a smaller but highly competent service such as VPN.ac, you will find that there are always areas where services will excel and areas where there is some improvement needed. We hope that we helped bring some light on the censorship situation in China and that once you decide which features are more important to your particular situation, you will find sufficient information to make a decision. I’m glad somebody else has noticed that such a high profile VPN site like Express vpn is not blocked in China when pretty much all others are. Looking at their website it’s hard to see exactly who they are too which is worrying and which has stopped me using their service in the past. Their service is supposed to work well here when so many other providers are blocked and like you said their website isn’t blocked. Doesn’t anybody else think this is suspicious? How do we know who is behind them? Do they have links with the Chinese Government? How do we know what they are logging? For all we know they could be the Chinese Government using the service as entrapment or for secretly monitoring citizen internet use. Haha yeah, I’m a bit of a conspiracy theorist but it makes sense. I am staying in Northern China regularly and had tried both Express VPN and VPN.ac. After a month of use, I had ask for a refund in Express VPN cos the connection speed was slow and sometimes cannot be connected despite using its various connection methods and servers. I have been using VPN.ac ever since and there are not many issues with this provider except not very often, the server that I am using is slow or cannot connect. Most of the time, I dont have to bother about changing server or the method of connection. Speed is decent an if I use L2TP/IPSec the speed is normally the fastest with upload speed between 3.5 to 4.5Mbps and download speed between 7Mbps to 28Mbps depending on the time of the usage. Ping is normally between 120 to 220ms even for other types of connections. I am normally using HK, Korea or Japan servers which are nearest to where I stay. If I am not connected to VPN, an average upload speed is around 4.8-5.2Mbps and download speed around 20-35Mpbs. You have to email your questions to their Tech support and they will respond to you normally within 24 hours. Tech support is average and out of 5 times, you will get 3 times of your issues resolved. But this is normally not necessary just that when you start using it, you will need help to get things familiarised. Other than this, I dont see any requirement of consulting the them that often. Overall, I can say that VPN.ac is by far the best that I had used after using a few more providers. 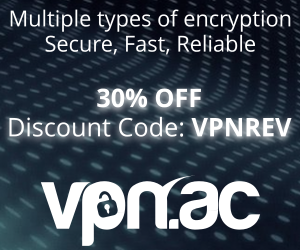 Their price is not the cheapest but if you want a reliable VPN service provider, this will be the one at least for now. Your experience with ExpressVPN or other VPNs will depend on the servers you choose. You will get the best performance when using servers that are hosted in data centers with China Telecom CN2 routing. For ExpressVPN, that would be Hong Kong 1 and Hong Kong 3. For VPN.ac, they have one in Germany. The latency is not great but the speed and reliability is pretty good.